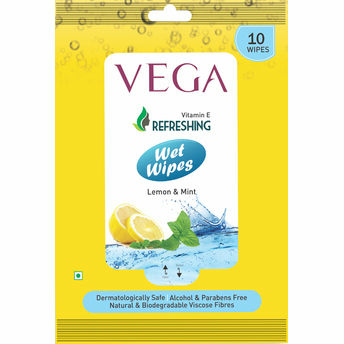 Vega refreshing wet wipes are natural and biodegradable, made of viscose fibers.Vega refreshing wipes help clean dirt and excess oil from face and neck leaving skin smooth and fresh. These wipes are enriched with Lemon for skin brightening, Mint for cooling and Vitamin E Oil for antioxidant benefits. Explore the entire range of Face Wipes available on Nykaa. Shop more Vega products here.You can browse through the complete world of Vega Face Wipes .